A majority of Americans (68%) have an unfavorable opinion of Russian President Vladimir Putin. Just 16% see Putin favorably, with more Republicans than Democrats holding that view. 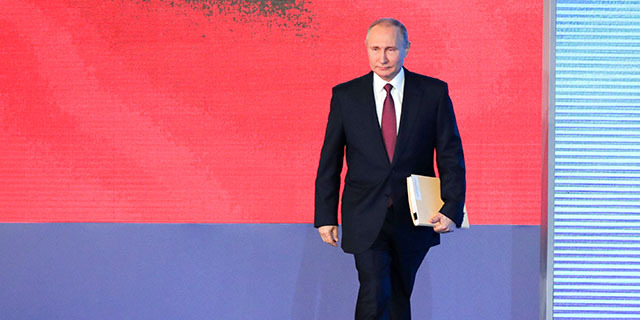 A quarter of Republicans and Republican-leaning independents (25%) said they had a favorable view of Putin overall, according to a Pew Research Center survey conducted in January before the Russian leader’s re-election. Just 9% of Democrats and Democratic leaners had a favorable view of Putin. About three-quarters of Democrats (76%), on the other hand, held an unfavorable view of the Russian president, compared with a smaller majority of Republicans (62%). Republicans’ views of Putin became somewhat more positive between 2015 and 2017, but have changed little since last year. The share of Republicans viewing him favorably more than doubled between 2015 and 2017, from 11% to 27%. 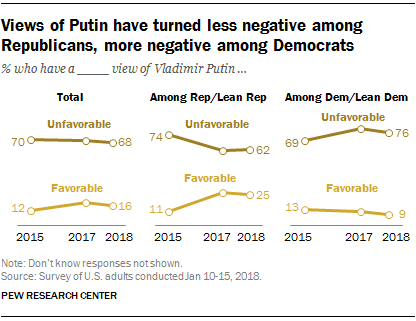 Conversely, more Democrats viewed Putin unfavorably in 2017 (79%) than did so in 2015 (69%), but there has been little change since last year. Other significant partisan shifts in views of Russia have taken place in recent years. For many years, Republicans and Democrats shared similar views about whether Russia posed a major threat to the United States. For example, as recently as April 2016, 46% of Republicans and 37% of Democrats said “tensions with Russia” were a major threat to U.S. well-being. By January 2017, after the presidential election, Democrats had become far more likely than Republicans to view Russia as a threat – though views have changed little since then. 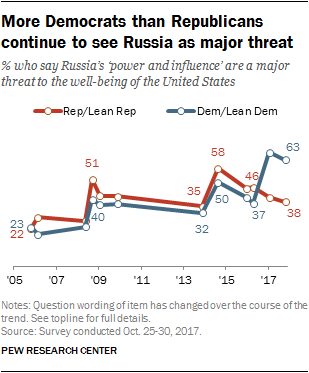 When the question was most recently asked in October 2017, there was a 25-percentage-point partisan gap: 63% of Democrats and just 38% of Republicans said they viewed “Russia’s power and influence” as a major threat to the well-being of the U.S. Overall, 52% of Americans saw Russia’s power and influence as a major threat.